Economic shocks are supposed to be temporary, most economists would say. The ensuing recovery might be slow, but eventually consumers and businesses start spending again, the financial markets' "animal spirits" awaken and growth returns to normal. The following chart from Nobel Prize-winning economist Robert Lucas reflects this view in a simple line graph. 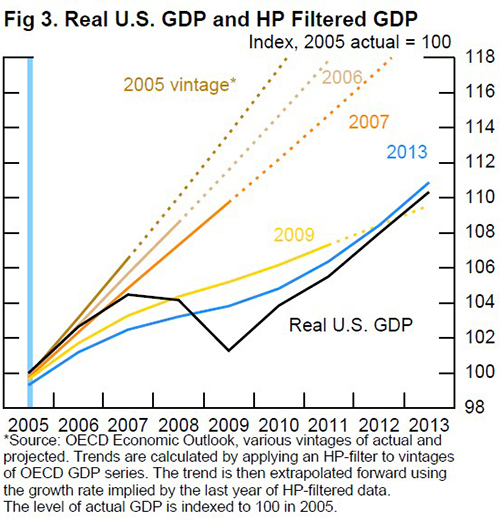 The red line represents trend economic growth in the U.S. over a nearly 140-year period. The blue line shows the fluctuations in "aggregate demand" -- or the quantity of products and services that buyers want -- that cause the economy to deviate from, and then return to, that trend rate of growth. But what if the economy decides to ignore this pattern? The fallout from the Great Recession and grindingly slow recovery has many people wondering just how long it will be before things return to normal. Recent research, including a study out this month by economists Robert F. Martin, Teyanna Munyan and Beth Anne Wilson of the Federal Reserve, also calls this long-held belief into question. Their work, which examines the experience of 23 countries since 1970, makes two major, and related, points. First, economic output doesn't return to normal following a recession, especially a major one. Second, that requires forecasters who were expecting growth to return to trend to instead repeatedly ratchet down their measures of how quickly things are bouncing back. For example, if you look carefully at the graph above, you can observe the red trend-line bending in a way that makes the shocks look temporary. Without those bends, the shocks would be permanent. The upshot: The economy doesn't return to trend so much as the trend is revised downward to reflect weaker economic output. "Interestingly, much of the downward revision to estimates of trend output happens well into the recovery," the authors note. "In particular, as economies recover and the lower level of actual output persists, potential output is gradually revised down toward actual GDP." The conclusion is that demand shocks may have a permanent impact on a country's GDP. In short, the shocks are not fully reversed over time as economists have long believed. What does that mean in practice? In the job market, it could mean that the long-term unemployed never find work. If the Fed researchers are correct, that has enormous implications for what might be necessary to help the U.S. economy get back on track. Government policies to maintain employment -- by modernizing the country's aging roads, bridges and other infrastructure, for example -- may avoid some of the permanent effects of the cataclysm that followed the 2008 financial crisis.